Comforting, creamy, nutritious and fun to eat, this soup is sure to become an all-time favorite, and it's so easy to make. Combined with vegetable broth and coconut milk, this delicious soup is a complete meal in itself—great for a light dinner or for a warm and soothing lunch. It's also a tasty spin on the traditional noodle soup if you're fighting a cold or flu, and thanks to mood-boosting lemongrass, it'll put some pep in your step to boot. You'll savor the lovely taste. Cook noodles according to instructions on package. Cover and set aside. Place stock in a soup pot together with lemongrass (include leftover stalk pieces if using fresh), plus galangal (or ginger), whole lime leaves or lime juice, and carrots. Bring to a boil, then reduce heat to medium. Allow to simmer while you chop up and add the remaining vegetables. Simmer until vegetables have softened but are still bright in color (about 5 minutes). Reduce heat to minimum and add the coconut milk, stirring to dissolve. Finally, add the tofu, gently stirring so it doesn't fall apart. Add the soy sauce. If you prefer your soup spicy, add some fresh-cut chilies or 1 to 2 teaspoons chili sauce—or simply serve it on the side. Do a taste test, adding more soy sauce if not salty enough. If you find the soup too salty (this depends on how salty your broth was to start with), add 1 to 2 tablespoons lime juice. If too sour for your taste, add 1 teaspoon sugar. Portion out noodles into bowls. 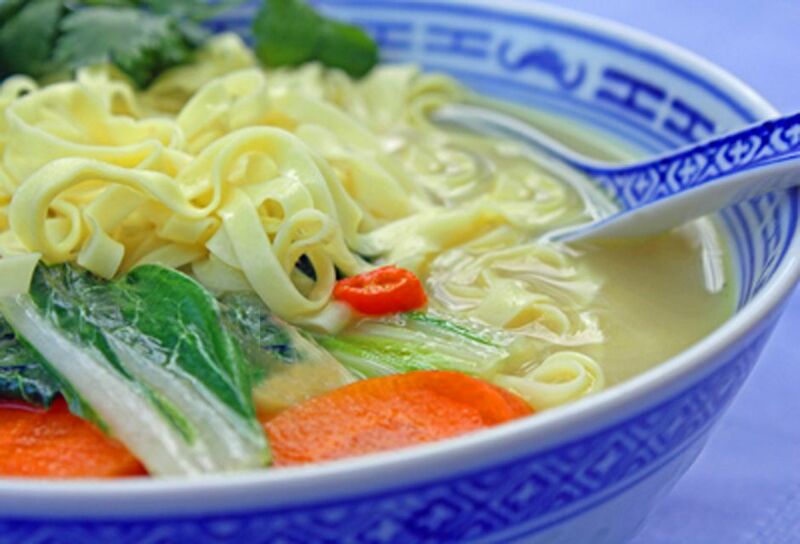 Pour several ladles of soup over each bowl of noodles. Sprinkle with fresh basil, and serve with chili sauce on the side, if desired—either store-bought or homemade Thai Chili Sauce (Nam Prik Pao) for an extra kick of flavor and spice.